The 13th edition of the research Workshop on “Macroeconomic Dynamics: Theory and Applications” was held on December 19, 2014, at EIEF – Einaudi Institute for Eonomics and Finance. The workshop brought together researchers working on dynamic macroeconomics issues, both theoretical and applied, to discuss research papers and agendas. It aims at fostering interactions between economists doing frontier research. For further details, please see the Program. EIEF hosted the 60th Economic Policy Panel on October 24-25, 2014. The meeting was jointly organized by the Economic Policy editors, the CEPR and the Bank of Italy. During the meeting papers, commissioned for the journal, were presented and discussed by the members of the Economic Policy Panel. For further details, please see the Program. 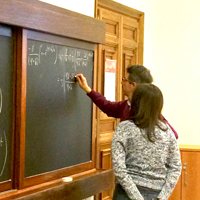 The 2014 edition of the Annual Central Bank Workshop on the Microstructure of Financial Markets was held on October 2-3, 2014 at EIEF- Einaudi Institute for Economics and Finance in Rome. The workshop was the tenth in a series of annual workshops that give researchers, policy-makers and practitioners the opportunity to discuss theoretical work, empirical findings and policy implications related to the microstructure of financial markets. Previous sessions were held in Oslo, Budapest, Hong Kong, Zurich, New York, Stavanger, Ottawa, and Frankfurt. Keynote speakers were: Terrence Hendershott (University of California Berkeley-Haas) and Dimitri Vayanos (London School of Economics). The presentations of both the authors and dicussants are now available on the Program. The second Strategic Forum entitled “Measurement of Economic Performance and Social Progress on Intra-generational and Inter-generational Sustainability” was held on Monday 22 and Tuesday 23 September 2014. The event - sponsored by the International Statistical Institute (ISI), the International Economic Association (IEA), the High-Level Expert Group on the Measurement of Economic Performance and Social Progress, and the OECD, with the support of SAS - has been hosted by the Einaudi Institute for Economics and Finance (EIEF) and the Bank of Italy and brought together economists, statisticians and other experts to promote the development of new tools for measuring economic and social progress on sustainability between the different generations. 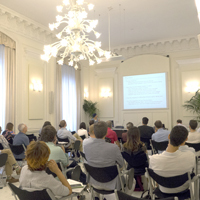 The Einaudi Institute for Economics and Finance (EIEF), the Bank of Italy, the Collaborative Research Center “Statistical Modelling of Nonlinear Dynamic Processes” (SFB 823) and the Deutsche Forschungsgemeinschaft (DFG) organized two international workshops, held in Rome September 11-13, 2014, on EIEF’s premises. The first workshop (September 11-12) was on “New Developments in Econometrics and Time Series”; the second (September 13), on “Dynamic Factor Models and Structural VAR Analysis” was in celebration of Marco Lippi’s 70th birthday. For details, see the Program. The Einaudi Institute for Economics and Finance (EIEF), the Center on Sustainable Architecture for Finance (SAFE) at Goethe University Frankfurt, HEC Paris and the Swedish House of Finance (SHoF) organized the “European Conference on Household Finance”, hosted this year by the Stockholm School of Economics. 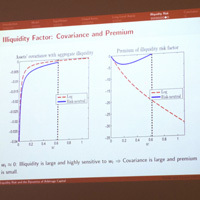 The conference was the fifth in a series of annual European conferences that aim to present state-of-the-art empirical research and empirically motivated theoretical research on household financial behavior and on how this is influenced by other choices, government policies, and the overall economic environment. Previous sessions were held in Athens, Rome and Oxford (go to Axa Chair for further details). EIEF hosted the Fourth Workshop of the fRDB Fellows and Affiliates. The aim of the workshop was to encourage interactions among its community of fellows and affiliates. For further details, please see the Program. 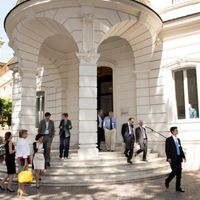 EIEF hosted the “3rd Rome Junior Conference on Macroeconomics”, a.k.a. Pizzanomics. The aim was to bring together junior economists from around the world with a strong interest in Macroeconomics, and to generate a friendly environment with intensive interaction, not only during the presentations but also informally before and after. The conference consisted in 10 presentations of 60 minutes each. Invited Speakers : Javier Bianchi (University of Wisconsin-Madison), Saki Bigio (Columbia Business School), Sebastian Di Tella (Stanford GSB), Matteo Maggiori (New York University, Stern), Ezra Oberfield (Princeton University), Edouard Schaal (New York University), Ali Shourideh, (Wharton School), Nicholas Trachter (Richmond FED), Juan Pablo Xandri (Princeton University), Ariel Zetlin-Jones (Carnegie Mellon University). Organizers: Guillermo Ordoñez (University of Pennsylvania), Facundo Piguillem (EIEF), and Nicholas Trachter (FED, Richmond). For details, please see the Program.